You wait all year for a Ryan Gosling film to come out then two come along in the same day. In this hugely enjoyable, if somewhat disjointed, romantic comedy/drama, the talented leading man gets to show a completely different side to the intense hardman he portrays behind the wheel in Drive. Sporadically funny, but never laugh out loud hilarious; there is still something innately likeable and indeed honest about Glenn Ficarra and John Requa's second film. Steve Carrell is Cal, a generally all round nice guy. When we first meet Cal, his wife Emily (Moore) is in the process of telling him she wants a divorce and has also been sleeping with Kevin Bacon's sleazy colleague. Cal reacts numbly, and then feebly attempts to move on. Alas, he's a bit rusty with the ladies until Ryan Gosling's ridiculously suave Jacob turns up and schools him in the way of the stud. Jacob has his own problems; seemingly shagging anyone who auditioned for America's Next Top Model, he's flummoxed when he meets Emma Stone's smart Hanna, who doesn't fall for his wily charms. 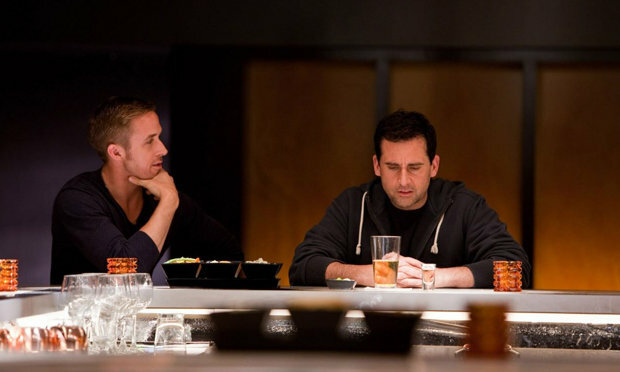 First and foremost; Crazy, Stupid, Love is more Steve Carrell's film than it is Goslings'. The young superstar in waiting is his usual charismatic self, but his subplot is regularly pushed aside for Carrell's nice guy. The balance is actually well struck, and there's generally just the right amount of time spent with both guys - both of whom are excellent. It's when it comes to giving Moore and (the always likeable) Stone their share of the screen time that this otherwise stellar romantic dramedy fails a little. It's also a little too over-reliant on coincidence to be taken seriously at times - when that's what it goes for tonally. When it's good, it's almost great. The early scenes with Gosling taking Carrell under his wing and teaching him the ways of the Jedi-rider veer between uncomfortable and amusing so organically it can't help but feel real. The middle-aged guy drinking himself into something resembling a confident swagger is pretty much staple in any pseudo-trendy bar. Carrell is one of those rare actors who's naturally funny, but capable of conveying an emotion other than "whacky." The empathy towards him is almost instant so good is his performance. We know a lot about Cal, but very little about Jacob - until he meets Hanna. Luckily, Gosling gives pretty much any role his embodies instant depth, and one line he gives Stone late on is enough to buy his entire reasoning for helping Cal. If you see one Ryan Gosling film this weekend make it Drive. But you could do a lot worse than this engaging, funny and lovely film.